Cliff Island Elementary School in Maine raised $1,354.15 in the 2017 Recycling Challenge. CLYNK will launch its seventh annual CLYNK for Schools Recycling Challenge, to take place Jan. 29 through March 26, 2018. CLYNK is urging schools located in towns within a 20-mile radius of CLYNK drop locations (Maine and New York) to participate. 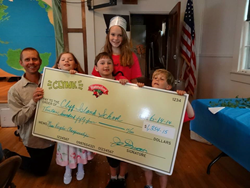 CLYNK encourages schools to raise funds by collecting redeemable bottles and cans year-round and CLYNKing at participating Hannaford Supermarkets. During the annual Recycling Challenge each winter, schools get even more change for their efforts. For every one dollar raised in the Challenge period, schools receive a bonus 50 cent match from Hannaford, plus the opportunity to compete for other cash prizes provided by CLYNK. Last year’s winners raised an average of $1,500 per school. The Challenge is offered in both Maine and New York, and schools will only compete against schools in their state. First ($1,500) and second ($1,000) prize will be awarded per state for schools who collect the highest number of redeemable containers. Third place ($500) will be awarded per state for schools that put forth extraordinary effort, as identified by CLYNK. Cash prizes are awarded in addition to the redemption funds and bonus match. Official contest rules can be found at http://www.clynk.com. CLYNK for Schools Recycling Challenge is a way for schools to raise awareness around the environmental benefits of recycling while working together as one team to raise funds for school discretionary use. CLYNK offers tours, educational presentations, recycling games and Green Team start-up materials for K-12 schools interested in learning more about dual stream recycling. Schools can email community(at)clynk.com for more information.